Our hike up to Grinnell Glacier in Glacier National Park winds through alpine meadows, along the edge of ice-cut cliffs, up a waterfall staircase, and around a stubborn ram. The views are breathtaking in the most literal sense of that word. The three lakes filling the valley below us are an impossible blue. As the trail cuts back and forth, we catch glimpses of Grinnell’s steel white face. And then finally, we’re there, standing at the edge of a giant ice bath as two young boys skip rocks across the mirroring water. 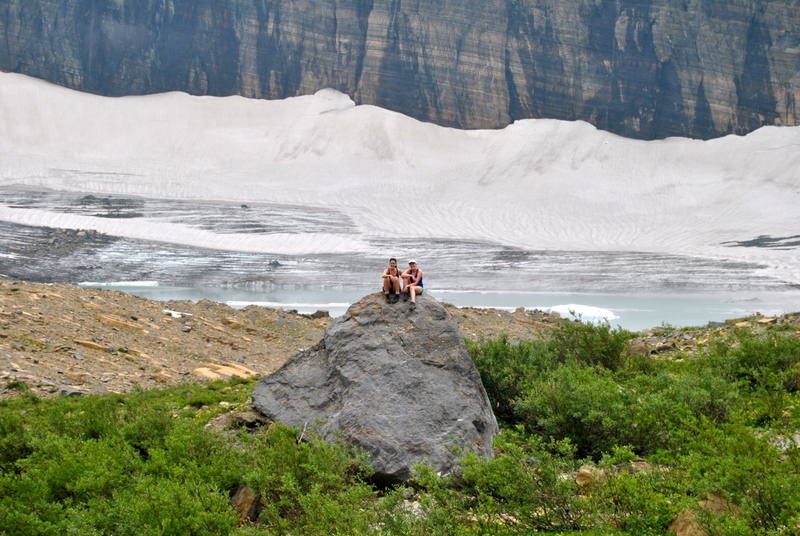 Allie Goldstein and Kirsten Howard atop a rock in front of Grinnell Glacier, which is retreating (melting) quickly.